This house has been raised approximately 4.5 feet. Please keep in mind that every house lift job is different and the cost of raising a house can vary greatly because of the different factors involved. The cost of elevating a house above the floodplain can vary greatly, but in general, a lift of a simple house on a pier and beam foundation could be $40,000, whereas a large, two story house could cost $250,000 or more. Below we have outlined some of the basic cost factors that are involved. Level 1 service is suitable for those homeowners / builders that want the house elevation service only. It does NOT include other services such as installation of a new foundation system, reconnection of plumbing or electrical systems, and other finishing tasks. It is suitable for slab lifts, slab separation lifts, and pier & beam lifts. Level 2 service is suitable for those homeowners / builders that want some, but not all of our services. It includes house elevation and installation of the new foundation system. It is suitable for slab lifts, slab separation lifts, and pier & beam lifts. Level 3 is our most complete house elevation service. It is a “turn key” service, that is, it includes all services from project concept to completion. This includes house elevation and all elements of the architectural, engineering, and structural design tasks. It does NOT include any interior remodeling. It is suitable for slab lifts, slab separation lifts, and pier & beam lifts. This house is in the process of having a foundation wall built for additional support and to enclose the area under the house. A house sitting on a Pier and Beam Foundation is usually the easiest and lowest-cost of all house raising situations because there is room under the house that allows worker access. However, the cost can increase significantly if there is any damaged or rotten wood present. Sub-floors with wood rot would also have to be replaced. 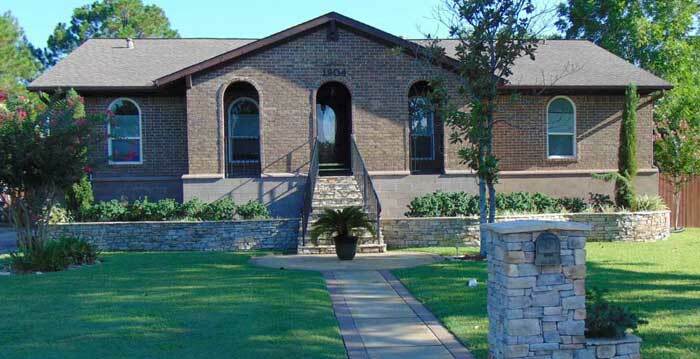 The most common type of foundation found in Texas is the concrete slab foundation. Unfortunately home builders build these foundations with a minimum of concrete and steel rebar. This results in slab foundations that are “minimally functional.” After 10 – 20 years these slab foundations begin to crack from the annual stresses of vertical, horizontal, and diagonal soil movement. A slab foundation that has experienced multiple major cracks is more complex and will require more labor and more support during and after a house lift.